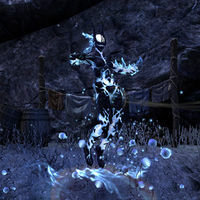 Cold-Flame Atronachs are the "inversion" of their better-known cousins, the flame atronach. The cold-flame atronach summons an essence of cold fire, and has a cold ambiance that notably drops the temperature nearby, the same way the flame atronach gives off heat. The cold-flame atronachs serve Molag Bal after an incident involving a flame atronach which lead to their banishment from his realms. A concerned denizen wanted find a replacement for their expressionless violence. After searching over 37,000 planes and realms he found a suitable replacement on the Fourth Sinus of Takubar, the apparent inversion of the flame atronach home on Infernace. This page was last modified on 8 January 2019, at 13:50.